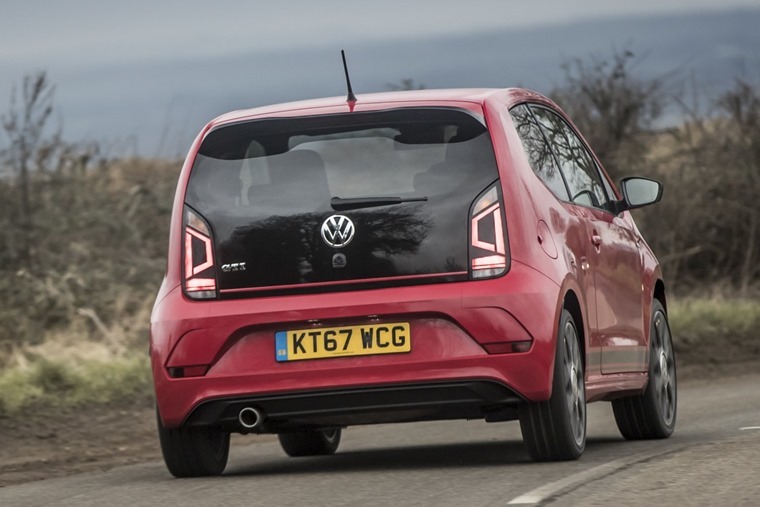 It might not be the swiftest from zero to 62mph, but Volkswagen's Up GTI is more fun than its key rivals, and that's what a warm hatch is all about. The warm hatch is a rare breed these days, so it’s a touch ironic that one of the best exponents of this class bears the most iconic hot hatch badges. 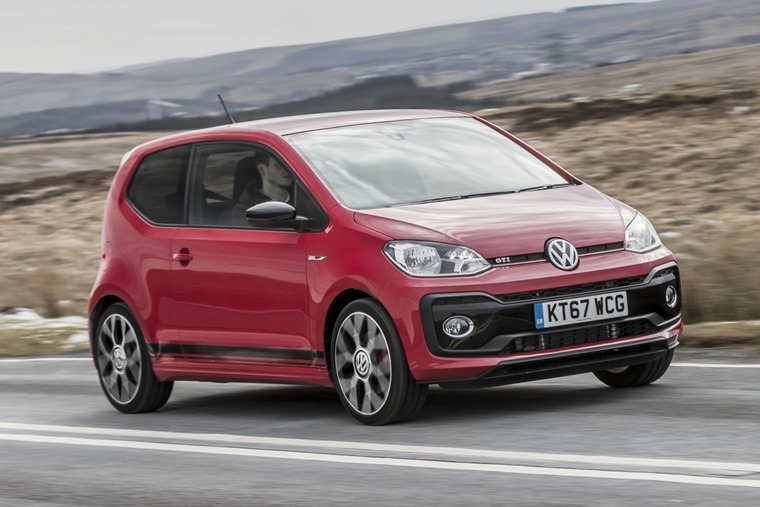 Welcome to the Volkswagen Up GTI. 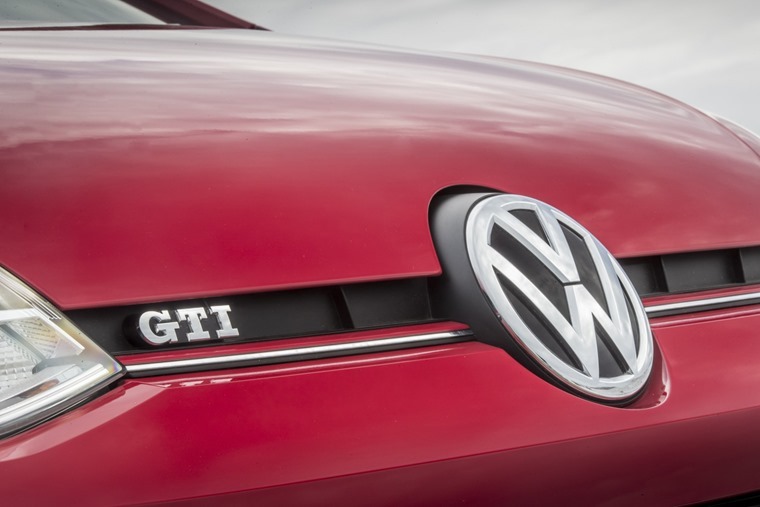 Certainly, the GTI moniker might lift expectations of what this pint pot puncher should be capable of. However, the reality is its performance figures are firmly in the warm hatch sector, taking 8.8 seconds to get from rest to 62mph and top speed is all done at 122mph. Still, that’s enough to keep the like of the Abarth 500 and Vauxhall Adam S on their mettle. 8.8 seconds to get from rest to 62mph is enough to keep the Abarth 500 on its mettle. Of course, what Volkswagen would like us to think is the Up GTI is a modern-day nod to the original Golf GTI, what with the similar power and pace, as well as a cabin decked out in plaid. The truth is, though, the Up is nothing like that ancient ancestor due to the new car’s 1070kg kerb weight compared to the 1970s model’s 810kg. Also, other than a convenient marketing opportunity, there’s no point dwelling on this connection any further. So, let’s consider the Up GTI in the here and now. What you get is an Up fitted with a turbocharged 1.0-litre, three-cylinder engine producing 115hp at 5000rpm. As has become common with this type of engine configuration, it makes a zingy noise as revs build and VW has allowed some more of the engine’s note to filter into the cabin to give that sporty sensation. VW has allowed some more of the engine’s note to filter into the cabin to give that sporty sensation. It works a treat as the Up GTI gives that tingle all good sporting hatches offer when you work the motor towards its red line. It’s happy to be treated like this too and lets you exploit the full ability of the power plant while remaining within the realms of legal speeds. At lower revs, the pick up is generally quick and smooth thanks to a 148lb ft wallop of torque that comes on song at just 2000rpm. The one caveat here is the Up GTI doesn’t cherish being driven in a higher gear and being reliant on that decent shove. It far prefers lower gears and some fizzy revs. It far prefers lower gears and some fizzy revs. In a warm hatch, we can accept this, even if it means the combined average economy of 58.9mpg is unlikely to be achieved. On the other hand, 110g/km CO2 emissions is very respectable for a sporty hatch. On move, the lower end of the rev scale becomes unimportant as you soon get into the rhythm of working the engine to its middle and upper sectors before selecting the next ratio in its six-speed manual gearbox. Yes, no DSG dual-clutch trickery here, just a good old-fashioned stick shift and clutch pedal, and it’s all the better for it. It’s where the Up GTI begins to win you over. 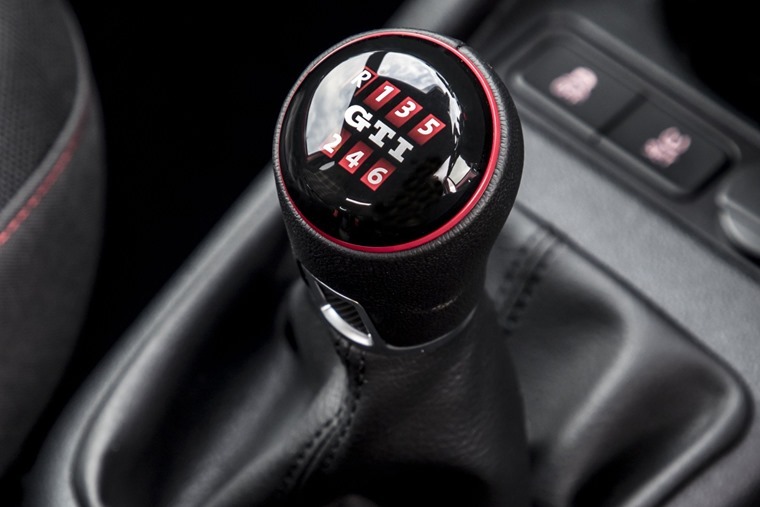 No DSG dual-clutch trickery here, just a good old-fashioned stick shift and clutch pedal. The reason for that is the VW is a car you engage with, interact with, rather than just punt it down a road in the knowledge the gearbox will swap cogs and the handling will see you round the next bend thanks to a suite of technology. In a similar way to Toyota opting for relatively narrow tyres on its GT86, Volkswagen has not gone for big, fat rubber for the sake of style on the Up GTI. Unlike Toyota’s, it not wilfully trying to make the handling interesting as the Up’s is fine as it is. Push too hard and the front tyres begin to run wide in typical front-drive fashion. 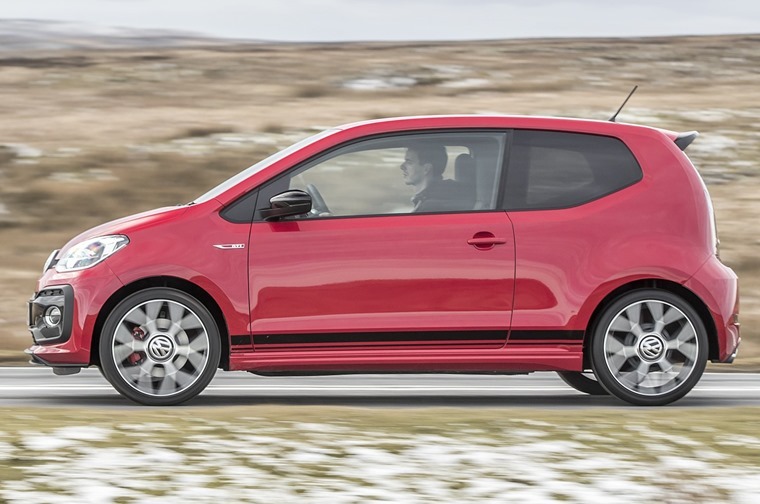 Try to unsettle the rear end with a deliberate lift-off mid-corner and the Up GTI has no unpleasantness waiting to catch you out; the back end sticks to its line and the front merely comes back onto course. Even the ride is absorbent despite being 15mm lower than other cars in the Up range. 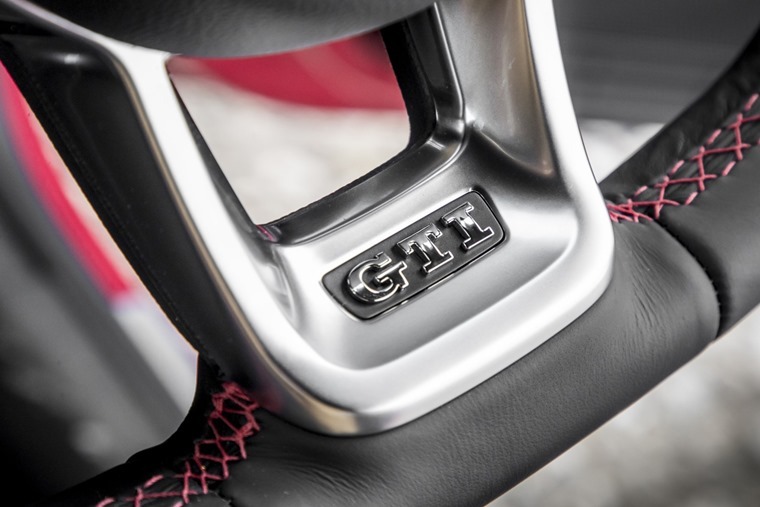 That doesn’t mean the Up GTI is dull to drive. Far from it. This is a fun, lively and wholly up to the moment warm hatch that lets you play when the opportunity arises. Yet it will also trundle to the shops, carry you to work and even manages enough space to ferry the kids about in the back just as any other Up model will. Unlike other Ups, the GTI’s cabin is much more inviting thanks to its tartan-clad seats, sporty gear stick with its light action, and a flat-bottomed steering wheel. This is a fun, lively and wholly up to the moment warm hatch that lets you play when the opportunity arises. The main dials are what you get across the Up line-up, while the Maps and More Dock lets you plug in your smartphone to access its apps and navigation through the infotainment system. Other distinguishing features are a couple of GTI badges and the Pixels Red finish for the main dash trim panel. Granted, this means Volkswagen has not gone overboard on the goodies with the Up GTI, but that also helps to hold the price to a very reasonable £13,755 for the three-door version and £14,155 for the five-door that has identical performance and running costs. Those list prices make the Up GTI cheaper than its key rivals from Abarth and Vauxhall, and also allow for some relatively attractive lease rates. What’s more important than 0-62mph times and price is the Volkswagen is the most fun to drive and that is what a warm hatch is all about.